“Green Insanity Is Flooding Towns and Destroying Lives” is an important article in American Thinker by columnist Joe Herring. 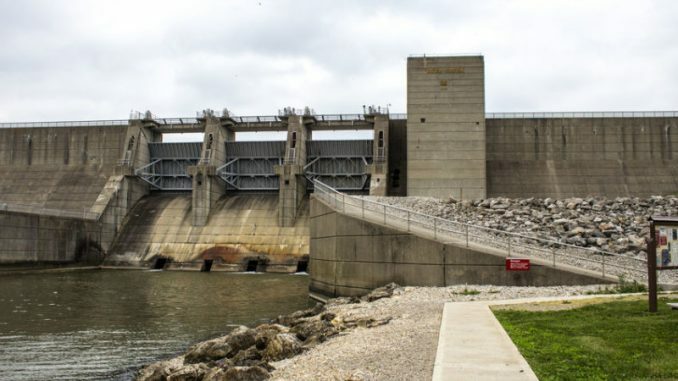 His article is about perverse green practices in the operation of America’s existing system of flood control dams, but it also applies to the need for new dams. Our national flood control system is only half built and we need to finish it. Flood control dams took one of the first hits from the tragic rise of radical environmentalism. The infamous National Environmental Policy Act (NEPA) was passed in large part to stop the federal flood control program, on the green grounds that reservoirs “drowned” rivers. It has been unfortunately successful in that regard. Here is how the black hole of environmental assessment works. The agency does its EIA, but opponents of the project challenge it in Court, on the grounds that some aspect has been overlooked. The Court then orders the agency to expand the EIA to include this new feature, which is likely to be time consuming and expensive. Since there is no end to possible (and speculative) environmental impacts, this delaying tactic can be used over and over again against a given project. In effect it creates a procedural black hole that the agency can never get out of. The Court never actually rules against the project, they just make building it impossible. That when rivers flood, they kill people and destroy their homes was deemed irrelevant under NEPA. As a result, destructive flooding continues. In fact it gets worse over time because of economic growth and development (which the greens also object to). It is time for this green tyranny to end. Flood control dams capture otherwise destructive flood waters, then release them slowly at a later time. Releasing this retained water can provide a number of useful services, including municipal water supply, irrigation and hydropower. Plus the reservoirs provide habitat and recreation. Many places that are subject to destructive flooding also see destructive droughts and dams can mitigate both in combination. For example, California has been in a major drought. Now there is tremendous snowpack in the Sierra Nevada Mountains. If this runs off too quickly it will cause serious flooding. Nor does California have the reservoir capacity to hold it all for drought relief. More dams would clearly be great under these combined flood and drought conditions, which are not unusual. We can argue all day over whether climate change will cause an increase in floods and droughts (I say not). But we all agree that there will be a lot of both to come. For those that do believe in serious climate change, some of the models project massive increases in both floods and droughts, which certainly calls for a lot more dams. On the hydropower side, flood control dams are often built in series. In such cases the water released by upstream dams then flows over those downstream. Thus the same water can generate renewable electricity several times. Many of the needed dams have already been designed. In fact many were authorized by Congress before the greens stopped them from being built. Most of these authorizations have expired but the plans are still on the drawing boards of the agencies. They need to be reauthorized. It would also help if NEPA were brought under control. Let’s build these dams and finish America’s flood control program. Then we can stop a lot of floods, cure a lot of droughts, save lives and property, and generate needed power along the way.